This is an example of what's called a gaming diary. Minesweeper is one of those games that come with all Windows versions since version 3.1 or something. The concept is pretty simple: You have a field, represented by little clickable squares, in which there are mines. 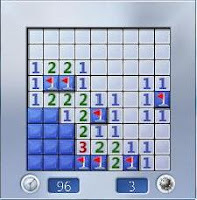 Your job is to clear the minefield by a) flagging all the squares where there is a mine or b) revealing all other squares. To help you in your job some thoughtful person has left numbered cards in some places which tell you how many mines can be found in the eight squares surrounding each card. With a bit of time and patience, it is usually possible to find all the mines, though depending on the version you are playing you might find yourself having to guess between a number of squares. with simpler systems that make sure that your first click never hits a mine. The game has even inspired the people over at College Humor to make a trailer for Minesweeper - The Movie. I first remember playing the game on my fathers ancient laptop some time in the very early 90's. The laptop, which weighed enough to make it all but desk-bound, displayed a beautiful playing field in black and orange on which I clicked on mine after mine. 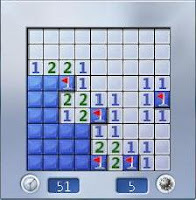 After a while I realised that there was a system to it and that it might not be such a good idea to click on the mines. In the end I managed to win a few games and was probably rather proud. 2. Let's clear some mines! OK, so we come up with a really nice start. Usually you don't see half the board cleared in one click, but hey: Got to be lucky sometimes! We can immediatly see 4 mines that need flagging and then a fifth which appears as the sweep proceeds. We keep moving from right to left in order not to miss anything. 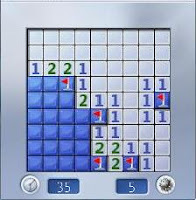 With the 2 wedged in between two mines we can safely clear all the remaining squares around it. The 3 appearing at the six o'clock position could be cause for alarm, thus prompting an attempt at circling around it. Flagging the second mine at the top left and clearing the surrounding blocks reveal a 2x1 island, effectively isolating the remaining block. Through inspection we can quite easily see the pattern appearing and so the perilous 3 is neutralised, but quickly joined by another of its kind. At this point I make a mistake. 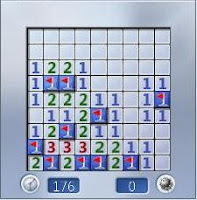 My hand slips and instead of clicking the square immediatly below the second 3, I hit the one just to the left, thankfully revealing another 3 instead of losing the game. After pausing to collect myself I then flag the final two mines and solve the board, clocking in on an abysmal 176 seconds, but glad to have gotten there at all after the earlier mishap. In reflection there wasn't anything wrong with the tactics applied, though improvements in the motorial skills-department is a necessity. Next time should probably see a raising of the difficulty level as well, but seeing as this was an exhibition game I think the level was appropriate. 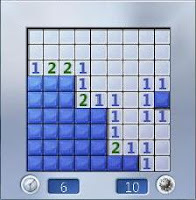 If you want to try it for yourself you can find the game in the folder "accessories", sub folder "games" if you use a Windows OS or download a copy of the World Rankings-certified Minesweeper X.